React Native Tab View Example Tutorial is today’s leading topic. 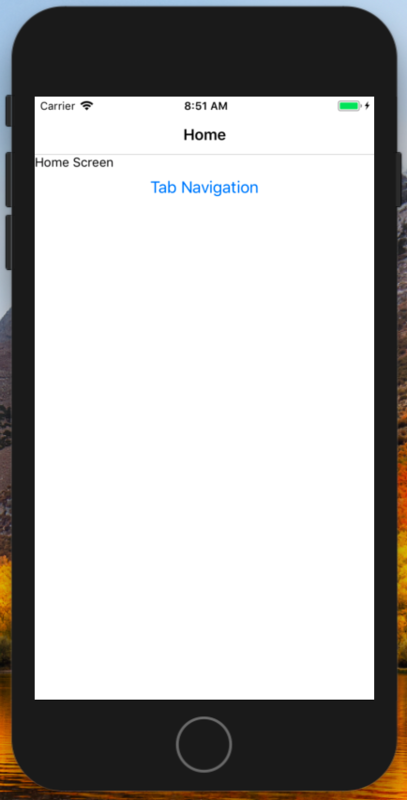 Recently I needed tabbed navigation for a React Native app I’m working on. So in this example, I will show you how you can create a tab navigation system in React Native. First, we register the different screens using Navigation object and then define this function startTabBasedApp(params) which contains an object as an argument. We have seen the startSingleScreenApp(params) in the previous example; now we will navigate through multiple screens using Tab Navigation. Now, start this example by installing, the React Native. 2 #1: Setup React Native For iOS device. 3 #2: Configure both the libraries inside XCode. 5 #4: Create a HomeScreen. 6 #5: Register all three screens. 7 #6: Add React Native Vector Icons. Okay, now we install the React Native using the React Native CLI. If you have not installed previously then install it globally using the following command. #1: Setup React Native For iOS device. Create a new project using the following command. Now go inside that project folder. Type the following command to install the libraries. So, we have used the react-native-navigation and react-native-vector-icons. Now, we need to configure this library. Remember, we will test our project on iOS simulators and not Android simulators. So this demo is oriented explicitly for the iOS development. 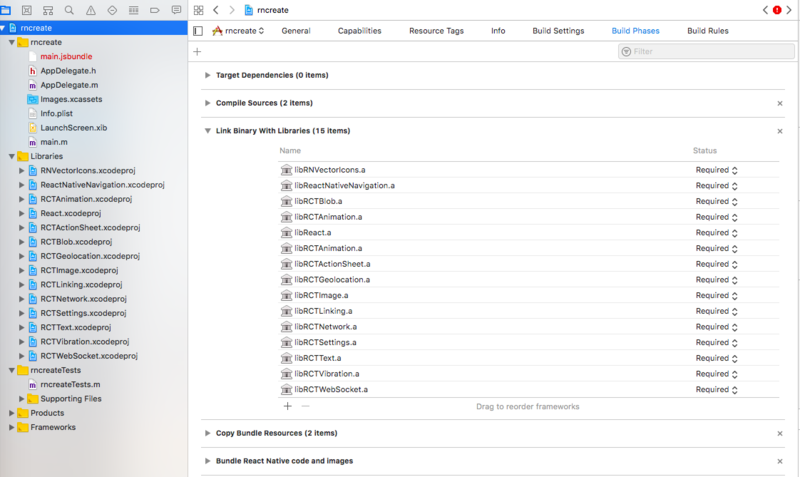 #2: Configure both the libraries inside XCode. Okay, now we need to open the project in the XCode. So open the Xcode and open the folder rncreate >> ios inside XCode. Now, we need to add the libraries from node_modules. Perform the following steps for react-native-navigation configuration. Open the iOS folder inside Xcode, and you will find the directory structure like this. Here, you can see one folder called Libraries. Right click on that folder and click on the Add Files to rncreate. It will open up the file browser. Now browse to the project root’s node_modules folder and navigate to the react-native-vector-icons and inside that Add the RNVectorIcons.xcodeproj. 2) The second step is inside Xcode, click on the root folder, you will get something like below. Here, I have already clicked on the Build Phases, but you need to click the Build Phases tab, and here also we need to add the files. Search for the file called libRNVectoricons.a and add the file and you are done. Now, you can close the XCode and open the project in your favorite editor. Inside the root folder, create one folder called screens and inside that create two files named following. Write the following code inside both of the files. Remember, when we navigate between different tabs, we will see these screens. Also, write the following code inside OutboxScreen.js file. In the same folder means inside screens folder, we also need to create one more file, which will be our main tab file. Let us call that file startMainTab.js and add the following code inside it. Here, we need to define all the screens, which has a tab layout. So we have created two screens till now. So we have passed the two items as an argument. Write the following code inside the startMainTab.js file. Here, we have destructured the Navigation object from react-native-navigation. Also called the startTabBasedApp() function on that object. It takes an object which consists of an array of different screens. Now, inside the screens folder, create one file called HomeScreen.js. Here we need to import that startMainTab.js file. When the application starts, we will see this screen and also one button titled Tab Navigation. #5: Register all three screens. Inside App.js file, we need to replace the code with the following code. App.js file is inside root folder. So, when the application starts, the first screen will be the HomeScreen. If we create 10-20 screens for our application, then we need to register all the screens over here. Now, we will not use index.js file which comes with React Native by default, instead of that, we will create our index.ios.js file for specifically iOS development. So inside the root, create an index.ios.js file and add the following code inside it. We need to import the App.js file, and that is it. Nothing more. If you have configured the settings of third-party libraries correctly then compile our project using the following command. You will see this first screen. Now click on the Tab Navigation button, and you will see the following screen. Here in the bottom, you can see the two tabs. You can click on it, and it will display the content accordingly. So here are basic React Native Tab View Example Tutorial is over. #6: Add React Native Vector Icons. Inside screens >> startMainTab.js file, we need to add the ionicons. So our final file looks like this. Finally, we have added icons to our application, and our React Native Tab View Example is over. Can u Explain why it doesnt work for android? which emulator do u use for reactnative?